Distract them with football games, political circuses and Black Friday sales. Keep them focused on their differences—economic, religious, environmental, political, racial—so they can never agree on anything. And then, when they’re so divided that they are incapable of joining forces against a common threat, start picking them off one by one. In the eyes of the government—whether that government is helmed by Barack Obama or Donald Trump or Hillary Clinton—there is no difference between Republicans and Democrats, between blacks and whites and every shade in the middle, between Native Americans and a nation of immigrants (no matter how long we’ve been here), between the lower class and the middle and upper classes, between religious and non-religious Americans, between those who march in lockstep with the police state and those who oppose its tactics. Subsequent reports by the Department of Homeland Security call on the government to identify, monitor and label right-wing and left-wing activists, military veterans and sovereign citizens as extremists (the words extremist and terrorist are used interchangeably in the reports). These reports indicate that for the government, anyone seen as opposing the government—whether they’re Left, Right or somewhere in between—is labeled an extremist. What the government has figured out is that as long as its oppression is focused on one particular group at a time—inner city blacks, gun-toting ranchers, environmental activists, etc.—there will be no outcry from the public at large. The liberal left will not speak up for the conservative right. The rightwing will not speak up for the leftwing. The economic elite will not speak up for the economically disadvantaged and vice versa. The ranchers will not speak up for the environmentalists, and the environmentalists will not speak up for the ranchers. The Democrats will not criticize endless wars, drone killings, militarized police, private prisons, etc., when sanctioned by their candidate. Same goes for the Republicans. What we’re dealing with is a full-blown case of national hypocrisy. The same infiltration and surveillance of ranch activists opposing the Bureau of Land Management in Oregon and Nevada over the past several years were used against nonviolent anti-war protesters more than a decade ago. That same mindset was embodied in the use of surveillance against those who gathered for Barack Obama’s inauguration eight years ago. 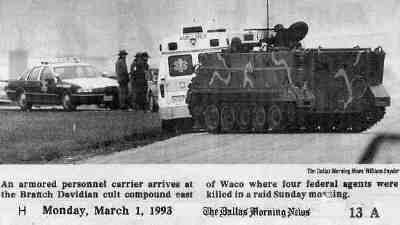 The same brutality that was in full force 20-plus years ago when the government raided the Branch Davidian religious compound near Waco, Texas—targeting residents with loud music, bright lights, bulldozers, flash-bang grenades, tear gas, tanks and gunfire, and leaving 80 individuals, including two dozen children, dead—were on full display more than 50 years ago when government agents unleashed fire hoses and police dogs on civil rights protesters, children included. The sticking point is not whether Americans must see eye-to-eye on these varied issues but whether they can agree that no one should be treated in such a fashion by their own government. Our greatest defense against home-grown tyranny has always been our strength in numbers as a citizenry. Despite these stark reminders that the government exists for our benefit and was intended to serve our needs, “We the People” have yet to marshal our greatest weapon against oppression: our strength lies in our numbers. Had 318 million Americans taken to the streets to protest the government’s SWAT team raids that left innocent children like Aiyana Jones or Baby Bou Bou dead or scarred, there would be no 80,000 SWAT team raids a year. Had 318 million Americans raised their voices against police shootings of unarmed citizens such as Alton Sterling and Walter Scott, there would be far less use of excessive force by the police. Had 318 million Americans stood shoulder-to-shoulder and rejected the ruling oligarchy, pork barrel legislation, profit-driven prisons, endless wars and asset forfeiture schemes, government corruption would be the exception rather than the rule. 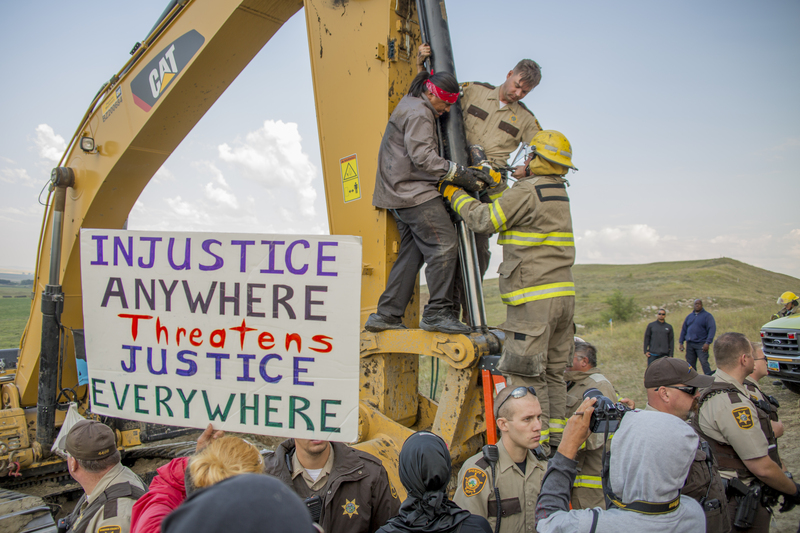 Had 318 million Americans told the government to stop drilling through sacred Native American lands, stop spraying protesters with water cannons in below-freezing temperatures, stop using its military might to intimidate and shut down First Amendment activity, and to stop allowing Corporate America to dictate how the battle lines are drawn, there would be no Standing Rock. Unfortunately, 318 million Americans have yet to agree on anything, especially the source of their oppression. This is how tyrants come to power and stay in power. Authoritarian regimes begin with incremental steps. Overcriminalization, surveillance of innocent citizens, imprisonment for nonviolent—victimless—crimes, etc. Slowly, bit by bit, the citizenry finds its freedoms being curtailed and undermined for the sake of national security. No one speaks up for those being targeted. No one resists these minor acts of oppression. No one recognizes the indoctrination into tyranny for what it is. As I point out in my book Battlefield America: The War on the American People, historically this failure to speak truth to power has resulted in whole populations being conditioned to tolerate unspoken cruelty toward their fellow human beings, a bystander syndrome in which people remain silent and disengaged—mere onlookers—in the face of abject horrors and injustice. Time has insulated us from the violence perpetrated by past regimes in their pursuit of power: the crucifixion and slaughter of innocents by the Romans, the torture of the Inquisition, the atrocities of the Nazis, the butchery of the Fascists, the bloodshed by the Communists, and the cold-blooded war machines run by the military industrial complex. We can disassociate from such violence. We can convince ourselves that we are somehow different from the victims of government abuse. We can treat news coverage of protests such as Standing Rock and the like as just another channel to flip in our search for better entertainment. We can continue to spout empty campaign rhetoric about how great America is, despite the evidence to the contrary. We can avoid responsibility for holding the government accountable. We can zip our lips and bind our hands and shut our eyes. In other words, we can continue to exist in a state of denial. Whatever we do or don’t do, it won’t change the facts: the police state is here. The people of Nazi Germany learned this lesson the hard way. The people of the American Police State will never have any hope of fighting government tyranny if we’re busy fighting each other. When all is said and done, the only thing we really need to agree on is that we are all Americans. So if this isn’t your fight—if you believe that authority is more important than liberty—if you don’t agree with a particular group’s position on an issue and by your silence tacitly support the treatment meted out to them—if you think you’re a better citizen or a more patriotic American—if you want to play it safe—and if don’t want to risk getting shot, tased, pepper-sprayed, struck with a baton, thrown to the ground, arrested and/or labeled an extremist—then by all means, remain silent. Stand down. Cower in the face of the police. Turn your eyes away from injustice. Find any excuse to suggest that the so-called victims of the police state deserved what they got. But remember, when that rifle (or taser, or water cannon, or bully stick) finally gets pointed in your direction—and it will—when there’s no one left to stand up for you or speak up for you, remember that you were warned.